The large "Wilhelm" arm shield is thought to be and upgrade to our chainmail shirts. Similar to a belt shield, those add ons can show the groups colours, insignia or heraldry. It is being fixed to the wearers upper arm with a belt and can be fastened to the mails rings by using a leather string. 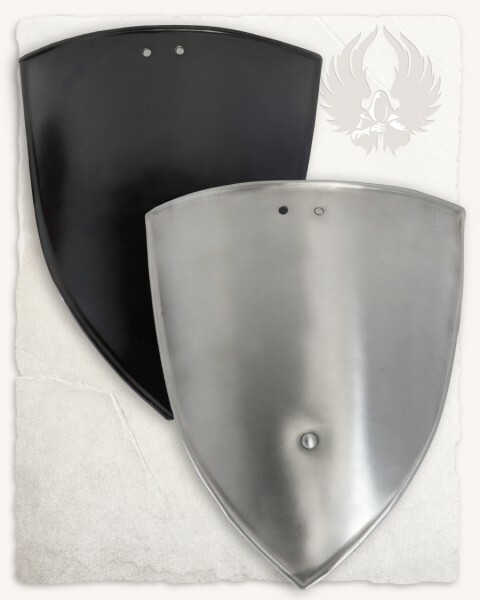 Made from armour steel, it is not only an additional armour plate, but also another nice detail on any existing costume. The shield can also be fastened to any other existing armour and clothing - there is no definite need for a chainmail. A gambeson can also be a good foundation: just sew a leather string to the sleeve and attach the shield there! You will only need some creativity and a little handywork. Talking of creativity: We suggest to clean the shield with Acetone prior to painting it. Afterwards just sand it with a paper with 600 grid. Use some automobile colour primer as the colour-matching foundation. When the foundation is fully dried, you should sand it again and apply a second layer of colour. Now is the time, where you can paint your details, like heraldry, animals and writings with weatherproof acrylic paint. We suggest to order a leather string from our stock: this way you have everything at hand, when starting to built your new upgrade.